Adjustable shawls are shawls which for reasons due to the mathematics of stitch repeats can be easily made smaller or larger. They are my favourite variety to design because they can be sized up or down based on the needs of the knitter or the amount of available yarn. As usual there is a Ravelry group for lovers of this type of design. You can get lots of ideas for shawls which fall into this category from the group. There's a long thread here listing many of them. Why aren't all shawls designed this way you ask? It's usually due to the the size and shape of the stitch repeat. 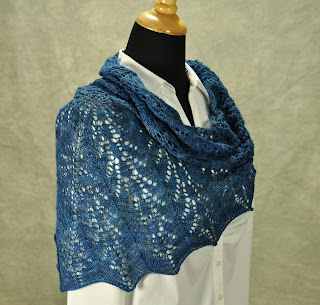 Which means sometimes gorgeous stitches don't get put into shawls if you are aiming for adaptability. My Mary Westmacott Shawl is a good example of one which cannot be easily adjusted. It is created with the beautiful Oriel Lace stitch. I love it so much I used it in several projects for myself before I started designing. 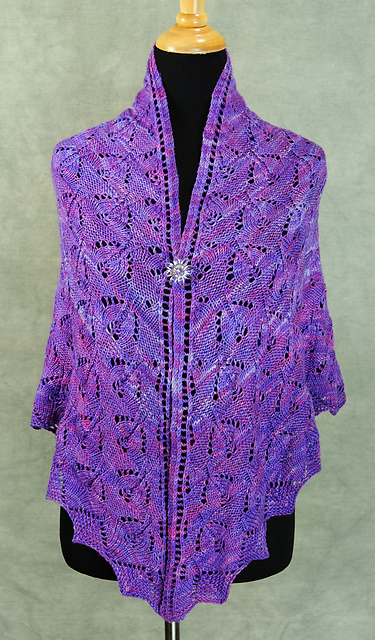 It's a bottom up design and can be enlarged by adding additional repeats at the cast on. The wrinkle is that if a knitter does add repeats there will come a time when the chart runs out but you will still have stitches on your needle. If you are a confident knitter and can maintain the pattern while shaping you are fine and can just keep going. Before I wrote patterns I did this for myself often. I would have a chart of the stitch repeat and I wouldn't bother charting anything else. When I make a pattern to sell I want to give you good value for your money, so I chart out everything. That means less experienced knitters have the ability to work on more complicated designs which would be outside their skill set. Mini Maiden, Handmaiden Fine Yarn. The entire shawlette is charted. It can easily be made larger by repeating Charts 2 and 3 any number of times more before completing the final chart for the border. The question is how do you calculate this based on your available yardage. I think I'll leave the answer and a few more examples of adjustable shawls for another post.